[ACT](VC) Limit Break 4 (This ability is active if you have four or more damage):[Soul Blast (6)] Look at three cards from the top of your deck, put them on top of your deck in any order, draw a card, and Soul Charge (1). [AUTO]:When this unit is placed on (VC), choose one of your rear-guards, search your deck for up to three cards with the same name as that unit, put them into your soul, and shuffle your deck. Genesis's turn, and as a branch clan to OTT, this one too calls back to the old gimmick of hating chance. LB, for Soulblast 6, you look at the top 3 cards, stack them in whatever order you like, then draw a card, then Soulcharge 1. 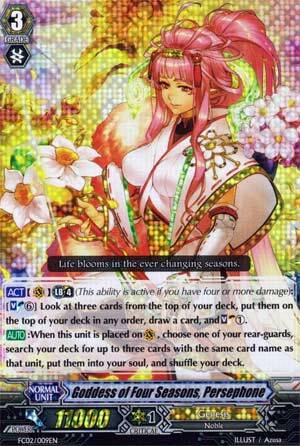 Normal skill is when ridden, move up to three copies of a rear-guard you have into the soul from the deck a la Reijy. ...So why would anyone use this again? Well, it basically lets you get one card to your soul that you don't want, one card in your hand you do want and a trigger, if there is one, to stay on the top for the drive checks. But it's a Soul Blast of 6, that... Seems pretty hefty, honestly. Your best bet with this card is to play her, get up to 3 units from the deck into the Soul, then survive a turn and ride into Minerva to swing twice and finish your opponent off that way. Overall, not that good, but thankfully it does have a nice set-up for Minerva. So it has that going for it, which is nice.